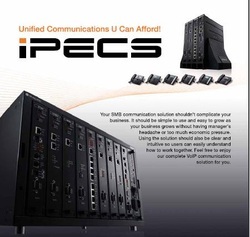 iPECS is a fully SMB dedicated IP communications solution without compromising well trained voice features and even becomes more intelligent as its phase 5.5 release. More than 30 years of experiencing SMB voice communications, LG-Ericsson has learnt how the complex voice features should be dealt with and more importantly it understands why the features are required from the customers. Installing iPECS, the customers can choose a call server from 5 different types depend on the size of the business from 50,100,300, 600 and up to 1,200 ports. The real time web admin offers the customer with simple and easy maintenance without having fully dedicated system manager. Mobility is also a expected benefit as businesses are having more and more connection with SOHO and branch offices. Remote IP phone, Softphone, wireless IP phones and mobile extention may provide a seamless connection wherever you are. Thanks to the broadband availability everywhere. By plugging in the RJ45 on the wall, you have communication through network to the system. Even three party video conference and application sharing can be managed by MFIM(Call server). More variety of IP phones are available; LIP-8000 series and 7000 series attracts the customers’ tastes with various looks while WIT-400HE(wireless IP phone) fully integrates it’s talent with MFIM. Standard SIP deskphone, IP8800 series and iPECS ACT-50 IP conference phone are also provided.